Two weeks ago I put up a post asking for your help picking a cover for my new book, Mencken and the Monsters. A book’s cover is critical to the book’s success. It’s not just a first impression, it is often what will determine whether or not a reader will give the book a chance. Unfortunately, while I believe Mencken in the Monsters is the best thing ever I’ve written, by the end of June, I was exhausted. So to design a cover, I opened a Power Point presentation and threw together five options I thought were “good enough.” I put pictures of the cover into a survey, put it up on this site, and asked you to vote on the one you liked best. Thank you. Your honesty was crucial to my success. When I received the first note, for a brief moment I allowed my ego to get in the way. I entertained a “Who are you to say that to me?” line of thinking. Thankfully, I was able to push that aside, take the position of a learner, and ask, “Why none of these?” The answers were exactly what I needed to hear. My ego is not my friend. When I begin to feel defensive, I need to slow down, take the position of a learner, and listen. Community is a necessity. I need readers and writers around me who aren’t afraid of telling me the truth. “Good enough” is never actually good enough. On the recommendation of an author group on Facebook and some personal friends, I reached out to Elizabeth Mackey for help. Elizabeth in an incredible cover designer who is both professional and reasonably priced. Check out her work here. After a few emails, she agreed to take on the series. Today I’m excited to announce that Mencken and the Monsters has an amazing cover that I think matches the quality of the story. Mencken Cassie is a passionate reporter on a mission to save Baltimore from an organized crime ring and a brutal hitman who is terrorizing the city. When Mencken declares war on the organization, he enters a world of monsters more terrifying than anything he could have ever imagined. To save the city he loves, Mencken must unmask the true threat to Baltimore by finding a new sources of strength in the community around him. 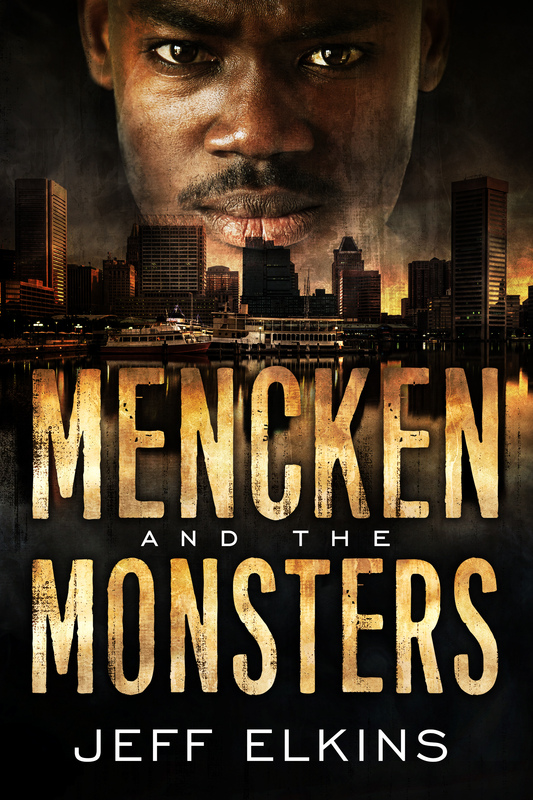 Mencken and the Monsters is an urban fantasy novel that features fast paced action, terrifying horror, clever dialog, and a compelling mystery. In this first installment of The Defense of Reality series, The gritty world of the Wire meets the thrilling world of a Stephen King novel. Mencken and the Monsters will be available on September 1st. I’m looking for people willing to give the book an honest review in exchange for a free advanced copy. If you are interested, hit me up in the comments of this post, on Facebook, or through email (jffelkins@gmail.com). And again, thank you to all of those who voted on and weren’t afraid to tell me the truth about my initial covers. I appreciate you looking out for me.